When rumours of Korg's new products leaked out a few days before the recent NAMM Convention, conspiracy theorists briefly ceased questioning whether the royal family are lizards, and leapt to their keyboards to announce that the KingKorg was a hoax. Their reasoning, for the most part, was that the name couldn't possibly be true. Someone was playing games with the poor, gullible keyboard-buying public, and we needed protecting by those with access to higher knowledge. Of course, the KingKorg (which I shall henceforth call the KK) duly appeared a few days later, and it then stimulated a very different response from those who had, um, never doubted that it was real in the first place. Now, the discussion turned to whether something that looked like a full-sized virtual analogue synth was what the world wanted from Korg in 2013. That was a much better question, and one that deserves answering. 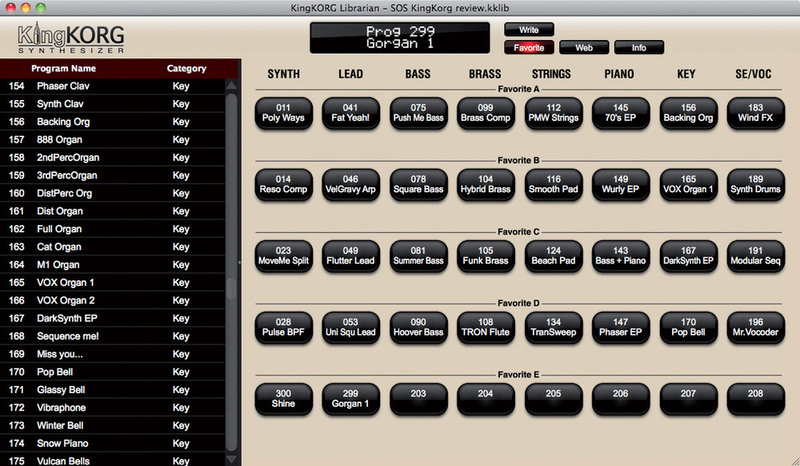 The KingKorg's forthcoming librarian software will allow users to edit the program list and manage patches. First things first. 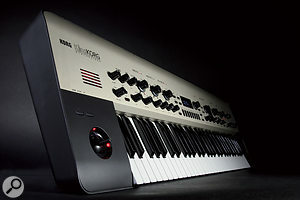 The KK is a digital synth, and its heart pumps binary blood called XMT, or Expanded Modelling Technology. OK, so that should be EMT, but let's not quibble... The name is clearly intended to suggest that it's the next step forward from the Multiple Modelling Technology that powers the Radias, R3 and MicroKorgs. Its fundamental building block is the Timbre, which comprises three oscillators, a filter and its associated ADSR contour generator, an amplifier and its ADSR contour generator, plus a pair of sync'able LFOs. With the exception of the third oscillator, this is possibly the closest you'll ever find to a 'standard' polysynth architecture. You can select from 126 initial waveforms: 32 analogue in nature, an extended set of 64 DWGS (Digital Waveform Generator System) waveforms, and 30 PCM (Pulse Code Modulation) samples. If you select an analogue wave, you can then adjust one or two parameters to further shape it into things such as supersaws and PWM waves. Other modifications include things such as decimation and decay on the noise sources (which suggests all manner of percussion sounds), detune amount on the dual and unison oscillators, and the modulation pitches (and, where appropriate, modulation depths) within the sync, ring modulation, cross-mod and FM oscillators. What's more, you can control all of these parameters dynamically. The DWGS waveforms are just as interesting because they are themselves dual oscillators that can be detuned and subject to VPM (frequency modulation) to create another huge range of initial sounds ranging from hybrid analogue/digital to full-blown FM. Understandably, the PCM samples have no such parameters, but they nonetheless provide a useful range of additional waves including pianos, Clavinets, organs, brass, strings, choirs and so on. The outputs of the oscillators are mixed and then passed to the filter section, which offers 18 filter options. Five of these were developed specifically for the KK, but the others will be of more interest to aficionados because they are modelled on the Minimoog, Prophet 5, SEM, MS20 and TB303. From the clean sweeps of the King and Moog models to the tortured screams and burblings of the MS20 and TB303, the KK offers a huge range of filter characteristics. A second screen provides information about the currently selected Program. It doesn't allow you to edit anything, but it's a useful aide-mémoire.You might think that the audio amplifier would offer nothing but gain controlled by its envelope or any modulation sources routed to it, but there are also pan and keyboard tracking parameters, plus something called 'Punch'. If the contours are fast enough, this adds a percussive element to the start of each note. Think of it as hugely exaggerated Hammond percussion, and you won't go far wrong. This then brings us to the modulation matrix, which offers six Virtual Patches, each with a source, a destination, and an amount. There are 12 sources: both envelope generators, both LFOs (which each offer seven waveforms including random and sample & hold, and a frequency range of 0.01Hz to 100Hz), the two joystick axes (with Y+ and Y- counting as separate sources), velocity, key tracking, and your choice of up to three MIDI controllers. You can route these with positive or negative polarity to no fewer than 41 destinations, so there's no shortage of modulation options. Unlike many polysynths, the Timbre provides two dedicated monophonic modes (one with multi-triggering, one without) that enable you to play it like a true monosynth. 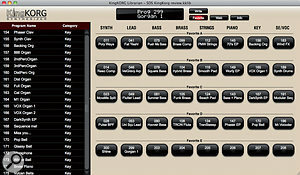 There's also Unison, with a maximum of four voices per note and programmable detune and spread across the soundstage. Add to this portamento and random pitch errors to simulate analogue instabilities, and that completes the voicing at the Timbre level. A Program comprises one or two Timbres (called A and B), either layered across the whole keyboard or placed either side of a user-definable split point. You can copy Timbres from one Program to another, and you can allocate them to independent MIDI channels, thus making the KK bi-timbral. There are a number of facilities that act within the Program as a whole. The first is the 16-band vocoder. This uses Timbre A or B, or a user-defined mix of both, as the carrier, and either the mic input or Timbre B as the modulator, with both having a 'straight through' setting that allows you to mix the vocoded signal with the modulator for those wondrous 'Jon & Vangelis' vocal effects. Parameters such as Formant Shift and Formant Hold control the frequencies of the filters that create the effect, and you can use these to create all manner of new sounds by vocoding obscure waveforms, shifting the filters around, using unison, chorusing the results and so on. Unfortunately, I was unable to find a way to vocode B with itself (Timbre A always has to be present), and there's no way to employ the mic signal as both the carrier and the modulator. This was my favourite trick on the Roland VP330, as it produces ghostly sounds that can't easily be obtained by other means. There are three Program effects units, each of which offers six effects types, with up to two manually adjustable (and MIDI-controllable) parameters for each. Very useable they are too, but there are some anomalies. For example, why would anyone place the e-piano and guitar amp/cab models at the start of the effects chain? You can't apply chorus or phasing to a sound after it has come out of a speaker cabinet, so that makes no sense at all. On a more positive note, you can apply each effect section to Timbre A, or Timbre B, or both. This means that, if you want to do things such as play a Wurlitzer sound through the e-piano amp/cab while playing a guitar sound through a chorus unit, and then apply reverb to both, you can do so. The last stages in the audio chain are the valve overdrive and a two-band (high/low) EQ. These are not programmable, and their actions are always determined by their top-panel controls. When I first played the KK, it seemed very thin, and I only later discovered that bass knob in the EQ was turned almost fully anti-clockwise. So check these settings frequently. If your audience is expecting a jaw-dropping, wrath-of-God bass note, you're going to look pretty silly if nothing more than a timid squeak emerges! Finally, we come to the arpeggiator, which offers the expected facilities. You can apply this to either Timbre or both, as you choose, which means that you can have an arpeggio running on one side of the keyboard while playing conventionally on the other. You can also transmit the output from the arpeggiator as a MIDI stream, or even arpeggiate notes received at the MIDI In while sending those generated by the keyboard to the MIDI Out without arpeggiation. (That's neat!) With a common sync for the arpeggiator, the LFOs, and the delay effects, some lovely results can be obtained. You can save a sound into any of the 100 programmable memories and allocate it to one of the nine Program categories. You can't save to the other 200 locations, but I understand the reasoning. Korg are marketing the KK to novices as well as experienced players, so retaining a selection of bread-and-butter presets makes sense. Nonetheless, 100 user memories is Spartan by modern standards. The KK offers five banks of eight 'Favourite' Programs. These are, in effect, 'live sets' that you can step through without having to burrow through the 300 memories while on stage. ("Um... excuse me. We'll start the next track as soon as I have found the right patch...”) Given the fact that two-thirds of the KK's memory is forever fixed, I feel that the Favourites are more of a necessity than a luxury, so I was very pleased to see them included. Happily, there's a Librarian in development, and the chaps at Korg sent me a pre-release copy to test. I loaded the software, launched it and, with the KK connected via USB, my Mac simply downloaded the memory from the synth and was ready to go. (As usual, PC/Windows users will have to install a hardware driver first, but this will be available from Korg's web site.) Moving sounds around in the Program list was simply a matter of dragging and dropping, duplicating them required nothing more than Copying & Pasting, and setting up banks of Favourites was just a question of dropping the wanted Programs into position. All in all, it was a doddle. The KingKorg's straightforward front panel belies the complexity beneath. The first thing you'll notice when using the KK is that it's light — so light that you'll have to remind yourself that it's a serious synthesizer. Having just played two consecutive nights using keyboards weighing around 100kg, I genuinely appreciate its manageability, but this comes at a price. Well, two prices. Firstly, there's the wall-wart. In my view, external power supplies are not serious, gigging devices and, since the KK is being marketed as a performance synth, it should have an internal PSU with a nice, robust IEC socket on the back. Secondly, the KK's keyboard has a very light action. This doesn't mean that it's bad; it's quite suitable for traditional synth work. But, despite offering a range of velocity curves plus three keyboard responses (normal, shallow and deep) on a per-Program basis, I wouldn't choose to play piano solos on it. I also find it disappointing that the KK lacks aftertouch. Korg are not the only manufacturer to release a performance synth lacking this, and I wish that they would all stop doing it. The spacious control panel and the dedicated oscillator/filter displays make it possible to program the KK with a minimum of fuss, although the rotary encoders have a little more wobble than I had expected and — as is common for their species — don't always change values smoothly or return precisely to their default values when asked to do so. Nevertheless, there are many nice touches worthy of mention. Every parameter is available in one of two menus: the Program menu and the Global menu. If a parameter is relevant, it's visible; if it's not relevant (perhaps because a section is switched off) it's not. That's neat, and if you prefer to edit in that fashion, it's quick and simple to do so. You don't even have to scroll far to find things. Touch a control in a relevant section, and the menu jumps directly to the first item that relates to it. You'll also find that some knobs double as push-switches. So, for example, if you want to change the oscillator type, you rotate the knob. If you want to jump between the families (analogue, DWGS, PCM, and the vocoder) you press the knob the appropriate number of times. 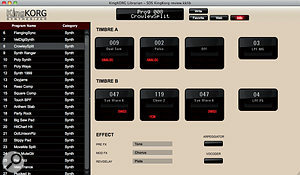 It's very intuitive and, within minutes, I found that I had plumbed the depths of the KK. Nothing is hidden, nothing is arcane. Somebody has actually thought about this interface! Nonetheless, I fear that Korg have overlooked an important issue. All the frequently tweaked synthesis controls, including the important filter cutoff and resonance knobs, are to the right of the control panel. This makes the KK ideal for left-handed players, but less so for people who play with their right hands while tweaking with their left. Now we get to the nitty-gritty. How — and how good — does the KK sound? Let's start with those 200 presets. Like all factory sounds, it's unlikely that these will be precisely what you need, but they may give a good indication of the breadth and scope of the instrument. Having spent a few hours working through them, discovering many that I like as well as a couple that I don't (the acoustic pianos), my overriding impression was 'smooth'. Sure, the KK can be loud, piercing, shrill, deep, fat, noisy and all those other decorative words, but it never stops being smooth. One reason for this is its almost total lack of digital artifacts, which is impressive. Programming the KK for myself, my first patch comprised just a single sawtooth wave, a King1 low-pass filter, a smooth attack and release, a touch of vibrato and some chorus. This was instant 1982, and I quickly discovered that the KK excels at the simple but warm pads that made the Polysix and Juno 60 so desirable. I then experimented with further 'analogue' waveforms and waveshaping options. For example, I used EG2 to sweep the waveshape of a single triangle wave and created a delicate PPG-ish sound, even before invoking the filters, modulation, effects, and all the other gubbins available. I then added a sine-wave oscillator an octave below, shaped the sound more, and added some chorus and reverb. Blimey! Now I was in Kawai K4 and Roland D50 territory! Adding additional 'analogue' oscillators steered me toward heavy polysynth territory and I found that, with up to three oscillators per Timbre, two Timbres per program, and multiple types of unison, the trick was to stop big, fat, mix-destroying pads and bass sounds from pouring out of the KK. So my next patches were designed to reveal any audible quantisation when tweaking knobs, and any zipper noise when sweeping the filters at high resonances or when self-oscillating. Happily, I failed to detect any quantisation or zipper noise. However, this was when I finally heard some aliasing; the self-oscillating filters will do so at the very tops of their frequency ranges. Don't worry about it. You want smooth filter sweeps? You got 'em. Next, I tried to emulate some of the hybrid sounds from Korg's mid-'80s dual-oscillator DWGS synths, and lost a whole evening rediscovering them. I often forget how much I like DWGS sounds, and how useful they are. I also discovered that the VPM capabilities within each DWGS oscillator are capable of taking the KK deep into territory often reserved for conventional FM synthesis. This was an unexpected bonus. Finally, it was time to experiment with the PCM waves. Although there's a temptation to use these imitatively, there's much to be gained by sculpting new sounds from them. I spent much of 1979 using the external signal processor and filters of my MS20 to mangle the sounds from my Logan String Melody 2, Crumar Organ and Hohner Pianet T and, in a sense, the KK gives you all of this in a single instrument. It's possible to program surprisingly good electric pianos, Mellotrons, and much else from the PCM waves, but it would be a shame if this were the limit of your use of them. Strangely, there was only one part of the KK that I barely touched throughout the review, and that was its valve 'boost'. In part, this was because it's in the wrong place: it lies after the rotary speaker and reverb effects, which is wrong. And, in part, it was because it didn't give me the grungy overdrive that I had expected. But while it may not be to my taste, I'm sure that some players will love it. Unfortunately, it seems that you will need to take the KK to a service centre should the valve ever need replacing. Remarkably, given that this was a pre-production unit, I found only one voicing error in the whole time that I was programming and testing the KK. If you over-stress the engine using four-voice unison, and then play repeated block chords with the sustain pedal depressed (which is not as arcane as you might think) it generates tiny clicks as voices are stolen, reinitialised and reallocated. These clicks are not loud, but neither are they ameliorated by extending the envelopes, so be careful. Some new synths bear all the hallmarks of success, while the futures of others are less clear. On the positive side, the KK is simple for the beginner, it offers depth for the expert, its lack of digital artifacts is admirable, and you could carry one around on a skateboard. It sounds good, and it's more flexible that you might imagine, too. But then there's the price. I had imagined that the KK would complete with the likes of the Roland Gaia and the StudioLogic Sledge but, with a list price of £1200 (bar a penny)$1299, it's in a different price band. So perhaps a better way to look at the KK would be to consider what it would cost to obtain this diversity of sounds and effects from vintage equipment. Sure, it doesn't imitate a Prophet, an MS20, a Minimoog, a DW8000, a Leslie, a Space Echo or anything else from the original era of analogue synthesis, but it can sound very similar, and it does a whole lot more besides. In the studio, it's undeniably small and neat, and if I wanted to use the sounds of a bunch of analogue synths on stage today, I certainly wouldn't sling a collection of heavy, delicate, temperamental and valuable vintage instruments into the back of the bus. With a bit of careful programming, a KK or two might be just the ticket. And my roadies would love me forever. In addition to its unbalanced quarter-inch audio outputs and its CV & Gate output, the KK offers three inputs: the balanced XLR microphone input for the vocoder, plus control inputs for a damper pedal and an assignable switch/expression pedal. MIDI In and Out are provided on five-pin DIN sockets as well as via USB. MIDI can be received from both ports simultaneously, with later messages taking priority. The final hole is the socket for the 12VDC wall wart. Interestingly, Korg have given the KK a momentary button that you have to hold down for a couple of seconds to switch it on or off. Once I had got used to this, I realised that this is rather clever, because it should stop people from switching it off by accident. Happily, the 3.5mm stereo headphone socket is at the front of the synth to the left of the bottom 'C', which is a much more sensible position than on the rear. The KK offers a CV & Gate output and supports multiple electrical standards (V/Oct, Hz/V, Gate, S-Trig and so on) so that it can control a wide range of analogue equipment. Unfortunately, rather than a conventional set of pitch CV, trigger and gate outputs, a single four-core (TRRS) socket is provided, and it's unlikely that you will have a cable to use this unless the destination is a Korg Monotribe (for which the cable is supplied with the KK itself). Lacking suitable converters, it took me an hour with a multimeter and a soldering iron to hook the KK up to my SH101, and there were times when someone in Cambridgeshire might have witnessed the first unassisted flight and unhappy landing of a 'king Korg. Nevertheless, I got things working, whereupon the two synths played perfectly in tune with one another. 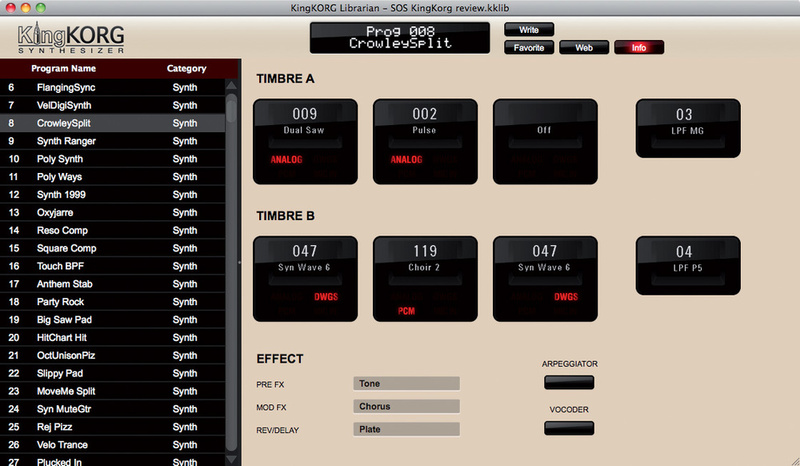 I then checked whether the KK would perform as a MIDI/CV converter. It doesn't; the CV & Gate signals seem only to be generated only when you play its keyboard. While testing this, I found myself wishing that the KK had a line-level external signal input. It would have been nice to return the audio from the SH101 and mix it with that generated within the KK, or even use it as another source for the vocoder. If you read Korg's description of the MicroKorg XL you'll discovered that its synth engine "offers traditional analog waveforms ... and PCM/DWGS waves for those vintage keyboards and strings”. There are also references to things such as its virtual patching, Formant Hold and Formant Shift functions. Does this sound familiar? It should. The KK may offer a 61-note full-sized keyboard, increased polyphony and a much enhanced control panel, but its lineage is clear. Of course, Korg couldn't call its new baby the MiniKorg (been there, done that in 1973) nor the MaxiKorg (likewise, in 1975) and, for obvious reasons, it couldn't be the MidiKorg. How about the MacroKorg, the SuperiorKorg, the SomewhatBetterThanBeforeKorg or... Hey! Howsabout calling it the KingKorg? We could even turn the letter 'i' into an image of the Empire State Building. That way, everyone would know that it was inspired by a giant gorilla that fell in love with a beautiful woman, was shot by a squadron of military biplanes, and fell to a horrible death in the streets of Manhattan. No? Well, it was just a thought. Number of Timbres per program Maximum two (layered or split). Memories 300 (200 preset, 100 user programmable). Number of program categories Eight. Oscillator types 32 x analogue & noise, 64 x DWGS, 30 x PCM, vocoder. Filter Types Seven x LPF, five x HPF, six x BPF. Number of EGs Two x ADSR. Number of programmablemod routings Six. Vocoder 16-band with Formant Shift and Hold. Max number of steps Eight. Types Six: up, down, Alt1, Alt2, random, trigger. Number of programmableeffects per program Three: Pre-FX, Mod-FX, reverb/delay. Global effects EQ and overdrive. Audio output L/R quarter-inch unbalanced. Control pedals Two: damper and programmable expression/switch. MIDI In and Out on five-pin DIN, plus USB. Analogue control CV & Gate out. Central display 16 x 2-character OLED. Osc and filter displays 128 x 64-pixel OLED each. It's wonderfully light and manageable for a five-octave synth. It's capable of producing convincing analogue sounds and a whole lot more besides. The programming architecture is deeper than it first appears. Its keyboard is very lightweight and lacks aftertouch. It has an external power supply. There are lower cost alternatives. The KingKorg is a brave release, entering a market dominated by low-cost alternatives and soft synths. Nonetheless, it does what it does very well. Despite some shortcomings, it's a very enjoyable synthesizer to program and play: simple, accessible, and capable of a much wider array of sounds than you might suppose. Korg UK +44 (0)1908 304600.